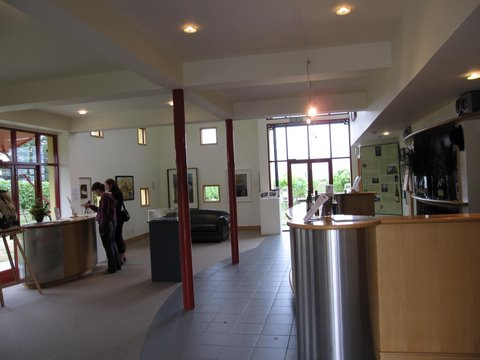 Slick modern tasting room/cellar door at Grove Mill, a Marlborough winery. Grove Mill has a bright and airy tasting room/cellar door. It offers complimentary tastings and an aroma demonstration. It allows visitors learn about the typical aromas associated with a Marlborough Sauvignon Blanc. They feel their mission as a winery is to produce “premium quality wines with minimal environmental impact”. They have implemented all kinds of different measures to lower their carbon imprint and are trying to use more organic farming methods. Right next to the winery is wetland with a path leading through it. On the far side of the wetland in a picnic area which you can enjoy lunch with a great bottle of Grove Mill wine and take in views of the Waihopai Valley and the Richmond Range. 2009 Home Block Sauvignon Blanc – made from grapes grown in a nearly organic manner on 17-year-old vines. Ian thought it was very nice, but Wendy was less impressed. 2008 Sauvignon Blanc – Failed to impress either of us. 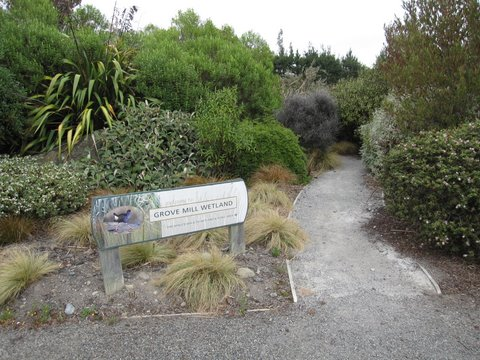 The entrance to the wetland next to the cellar door/tasting room at Grove Mill, a Marlborough winery. 2007 Riesling - Not fruity enough for either of us, a bit tangy. 2008 Pinot Noir – Just couldn’t really compete with what we’re used to from California. We were consistently under-whelmed by Marlborough red wine. Late Harvest Gewürztraminer – We thought this was the best wine we tasted at Grove Mill. Since it’s a dessert wine, it was predictably sweet, but with a great balance of fruitiness. We really enjoyed it.